Dissolve sugar and ½ cup salt in 2 quarts cold water in large container. Submerge chicken, cover, and refrigerate for at least 1 hours or up to 1 ½ hours. Meanwhile, combine butter, thyme, garlic, and lemon zest in bowl and refrigerate until needed. Adjust oven rack to lower middle position and heat oven to 500 degrees. Line broiler pan bottom with aluminum foil and spray with vegetable oil spray. Toss potatoes with 1 tablespoon oil and season with salt and pepper. Spread potatoes evenly over prepared broiler pan bottom and cover with broiler pan top. Remove chicken from brine, rinse well, and pat dry with paper towels. Butterfly chicken, flatten breastbone, and gently tuck wings behind back. Gently loosen center portion of skin covering each side of breast. Using spoon, place butter mixture underneath skin, and then gently press on skin to spread out butter mixture. Place chicken on slotted broiler pan top, brush with remaining 1 tablespoon oil, and season with pepper. Push each leg up to rest between thigh and breast. 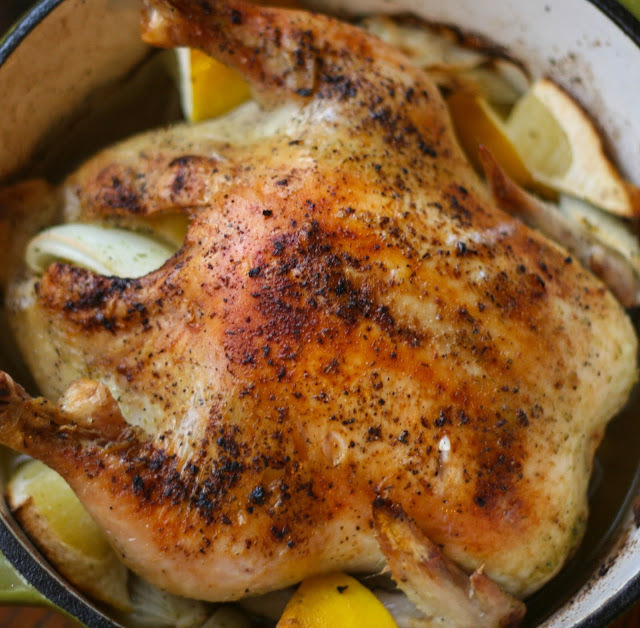 Roast chicken until skin is crisped and deep brown and breasts register 160 degrees and thighs register 175 degrees, 40 to 45 minutes. Rotating pan halfway through roasting. Transfer chicken to carving board; let rest for 10 minutes. Remove broiler pan top and using paper towels, soak up excess grease from potatoes; transfer to serving platter. Carve chicken; serve with potatoes. End.